According to the 22nd Global CEO Survey released in January and the Vietnam findings within the APEC CEO Survey 2018 (both conducted by PwC), digitization is top of mind for the majority of chief executives. In the financial services sector particularly, a lot of organizations are looking to transform from the traditional model to an end-to-end digital business model for better performance and profitable growth. And so local banks have raised a wave of transformation projects focused on next-gen technologies and streamlined operating models. Financial institutions are also required to deploy multiple projects related to risk mitigations and compliance to strengthen governance and controls in order to comply with regulations from the State Bank of Vietnam. However, plenty of those projects have faced difficulties in implementation and struggled to achieve their original objectives. To avoid the abovementioned setbacks and make sure the transition goes smoothly, banks must be fully aware of the importance of change management. Change management is a quite complex process that requires strong support from top management and people across all levels. And an effective change management program can help mitigate risks related to both the human side and operational effectiveness. PwC’s research and advisory experience show that organizations that have well-established change management programs are more likely to achieve their business goals and project objectives. In terms of timelines, up to 71 per cent of projects stay on or ahead of schedule when they have excellent change management. 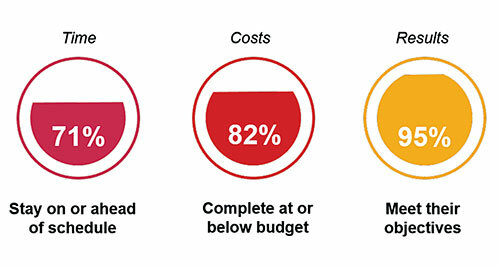 With regards to costs, 82 per cent of transformation programs with well-defined change management can complete their projects on or below budget. Excellent change management enables 95 per cent of projects to meet their objectives, making them six times more likely to succeed than those with poor or no change management. We consider it a good sign that an increasing number of our Vietnamese clients in the financial services sector are recognizing the importance of change management. For example, a large local commercial bank set aside up to 30 per cent of its budget in a large-scale digital project for the change management part, with a dedicated team working side-by-side with PwC consultants on a two-year journey. In another project on credit risk for a Vietnamese commercial bank in our clientele, we had some of the bank’s board members personally attend a change management workshop to send out a message of its importance to the success of the transformation. So how do financial institutions move through business transitions? For change to take effect, they often depend on the readiness and acceptance of their own people towards the new methods and processes. Yet it is not easy to help people adapt to change. Even though change is inevitable, people react to it by going through complicated psychological stages, from denial to resistance, bargaining, depression, and finally commitment (modelled after the Five Stages of Grief by Kübler-Ross). To deal with such issues, there are a variety of change management approaches that banks can employ for different project types and sizes. At PwC, we often customize solutions based on a holistic framework that incorporates both technical and emotional sides, so that change initiatives can be implemented and maintained smoothly with or without external consultants. Change management can include all or some of the following steps: Comprehensive change management strategy, Change impact assessment, Stakeholder identification and analysis, Change readiness assessment & Benefits realization plan, Defining change management priorities, Leadership alignment, and Managing communications and training. Alignment among senior management is critical for the success of a transformation project. In a recent project that we did on organizational restructuring, the client’s top team initially felt uncertain about their roles, triggering high anxiety that hindered them from being open with their peers. After many leadership alignment meetings, finally the management team agreed on one direction to move forward. Once the senior leaders are on the same page, they can set the tone for proactive and ongoing communications with consistent key messages, so that stakeholders at all levels stay informed and engaged. Moreover, a Project Management Office (PMO) with a combination of functional experts and project management specialists must be established to ensure successful execution. The PMO’s task is to manage the delivery of the whole transformation. A smart PMO will focus on proactive project risk management by thinking ahead based on timely identification and mitigation of issues. Based on our study of both failed and successful projects from numerous financial institutions, we believe that ample time and effort should be spent on change management. This applies to all kinds of transformation projects, be it upgrading the management system, going digital, deploying a talent management program, or enhancing business processes. One case in point: two leading Malaysian banks with over 300 branches merged together a couple of years ago. According to PwC specialists who were deeply involved in the merger, the two banks went through countless integration processes and it was an HR-led exercise that played the pivotal role in people change management for the transition.